Design.Create.Inspire: Can you help me? I just got an email from a friend of mine who wanted to let me know she couldn't read my blog. She sent me an email and showed me what she was seeing - YIKES!! IS ANYONE ELSE SEEING MY BLOG LIKE THIS???? I'm seeing your blog like it used to be only across the whole screen. It looks great on my computer. What web navigator is she using? Looks fine to me! So jealous of your 3 column layout! 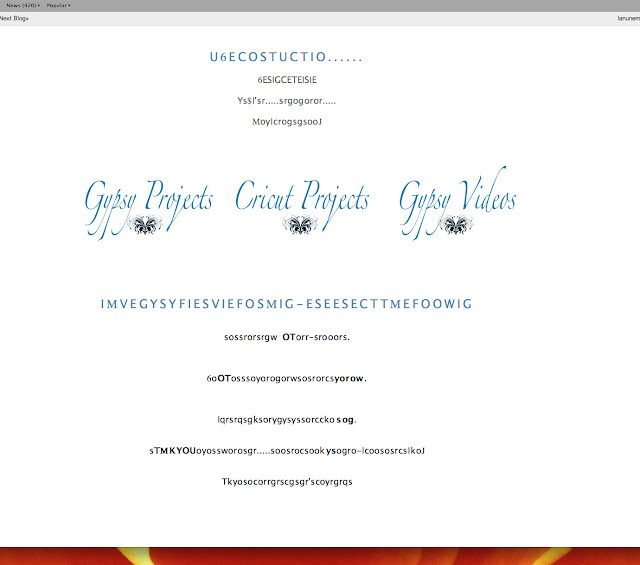 I'm seeing an Under Construction sign at the top, Then the project links, then your cut files copyright info. The whole page is white, with 3 columns. I clicked on the project links and they worked. I hope this helps. HI , nope not like that but I do see your left column cut off, like the button you made me, Joys button, etc. It looks fixed to me now. I am using Explorer. It looks really good on my screen. I have no weird writing and none of the buttons are cut off on my screent. I have IE 8 and my screen resolution is 1366 x 768. I love what you are doing. I really need to make time to revamp mine and learn how to make a button. I love the clean look you've got going. All I can see is Green!!! yes, Green with Envy, LOL, for the three columns blog. Now, on the serious side. It looks good to me. I use firefox and my resolution is 1280x800. Looks great to me ... awesome blog love it. No weird writting or anything like that. I'm using IE though. Hi Crystal, no I am seeing everything as it should be and that is wonderful. I'm seeing your site just fine. I use windows internet browser. Don't know resolution - whatever the default is. I'm seeing your blog perfectly ... love your new look! FYI - I'm using Safari. I'm seeing it normally now. Go to this site scroll down to where it is highlighted "how to adjust your margins". It works great, it how I fixed mine. simple just follow exactly. I can see you clearly!!! Thank you!!! is she seeing your blog through a reader dear then maybe she has set the language to other language. It looks fine to me except your right column is cutting off some of your info. See if she has her language set wrong. You show up just fine! By the way, love the banner's new colors and artwork - I have you linked to my blog and I did notice the other day that it said you were under construction, but I also knew you were changing things and didn't pay much attention to it. Itlooks great on my screen too! Its seriously amazing! I love your site!! I love your work. It is always an inspiration to me. I have left you a Sunshine Award for you on my blog. http://deannaspapercrafts.blogspot.com to show my appreciation of all you do. Hi Magoo! I have a beautiful blog award for you over on my blog! You'll have to stop by to grab it and read the rules! Congrats go out to you! I love your style and your blog is so fun to visit!